The Income Tax Department has said Aadhaar will be mandatory for filing of ITRs as well as obtaining a new PAN or permanent account number from July 1. The Income Tax Department has said Aadhaar will be mandatory for filing income tax returns (ITRs) as well as obtaining a new PAN or permanent account number from July 1. The Central Board of Direct Taxes, the policy-making body of the I-T department, released a fresh statement last week, saying: "Everyone who has been allotted permanent account number as on the 1st day of July, 2017, and who has aadhaar number or is eligible to obtain Aadhaar number, shall intimate his Aadhaar number to income tax authorities for the purpose of linking PAN with Aadhaar." The clarification by the taxman came after the Supreme Court on Friday said that those who have already been assigned Aadhaar IDs must use them for filing ITRs and link it to their PAN cards while others can proceed without it. The CBDT said: "Only a partial relief by the Court (Supreme Court) has been given to those who do not have Aadhaar and who do not wish to obtain Aadhaar for the time being, that their PAN will not be cancelled so that other consequences under the Income Tax Act for failing to quote PAN may not arise." Meanwhile, the Income Tax Department has in the recent past stepped up its efforts to encourage assessees to link their PAN with Aadhaar, a 12-digit number issued by Unique Identification Authority of India or UIDAI based on the demographic and biometric information of the person. In an email from its e-filing team, the Income Tax Department has urged the assessees to link Aadhaar with PAN as soon as possible. 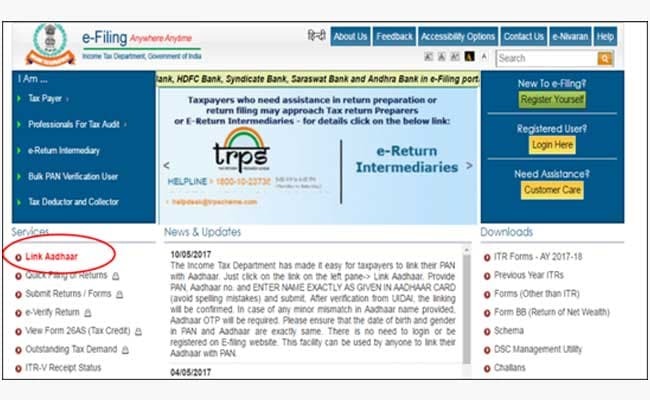 Once you are on the Income Tax Department's e-filing website - incometaxindiaefiling.gov.in, you need to spot and click on the new 'Link Aadhaar' hyperlink provided on the left hand side. Then provide PAN, Aadhaar No. and name in the respective fields and hit 'Submit'. "ENTER NAME EXACTLY AS GIVEN IN AADHAAR CARD (avoid spelling mistakes) and submit. After verification from UIDAI, the linking will be confirmed," the Income Tax Department said in the email. Please ensure that the date of birth and gender in PAN and Aadhaar are exactly same, the taxman said. The facility compares the names given in the Aadhaar and PAN through a validation process. 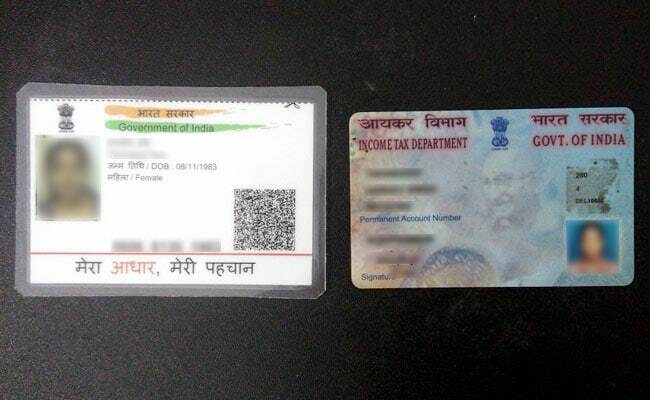 "In a rare case where Aadhaar name is completely different from name in PAN, then the linking will fail and taxpayer will be prompted to change the name in either Aadhaar or in PAN database." The Income Tax Department has said that the process of linking PAN with Aadhaar has been made easy for taxpayers, citing reports "that taxpayers were finding it difficult as their names did not match in both systems (E.g. Names with initials in one and expanded initials in another). Responding to such grievances, the Dept (Income Tax Department) has come out with a simple solution now." "Aadhaar can also be seeded into PAN database by quoting Aadhaar in PAN application form for new PAN allotment or by quoting Aadhaar in change request form used for reprint of PAN card," the taxman said in the advertisement. The link requires a person to punch in his or PAN number, Aadhaar number and the exact name as given in the Aadhaar card. "After verification from the UIDAI (Unique Identification Authority of India), the linking will be confirmed," it noted. The Income Tax Department has also urged taxpayers to link their Aadhaar with Permanent Account Numbers using an SMS-based facility. The Finance Act 2017 has made it mandatory for taxpayers to quote Aadhaar or enrolment ID of Aadhaar application form for filing of income tax returns. While Aadhaar is issued by the UIDAI or Unique Identification Authority of India to residents, PAN is a ten-digit alphanumeric number issued in the form of a card by the Income Tax Department to a person, firm or entity.